The cast-aside footballers of Cork reclaimed the rebel within and Mayo as ever showed they are by some way the most resilient team that has ever played the game. Lazarus only rose up the once. Mayo do it nearly every week. There are days when we weep for Gaelic football but on Saturday night, in the atmospheric Gaelic Grounds of sporting Limerick, we were privileged to witness one of the best football games ever played. Cork were a hurt team in search of healing. The hurlers are playing brilliantly and the footballers felt like castaways in their own county. There's a courageous cussedness about the people of Cork. It's not in them to give in. Maybe it comes from the days when they took on the Tans and won. Or it could be Cork feast off the deeds of the great sports people of yesteryear in this the best per capita sporting place to be found in Ireland and maybe even in the world. But I wonder who this Cork team were playing for on Saturday night? I doubt very much if it was their own county board. A lot of the big shots stayed at home to watch Tipp and Clare in the magnificent new stadium. Sad to say, but there were far more Cork supporters in Páirc Uí Chaoimh than in the Gaelic Grounds. We salute the real Cork footballing people, and we met a few on Saturday evening. They have a team again. We spoke to Billy Morgan, the Cluxton of his day. Billy said the worst part of getting beaten in Killarney was his Kerry friends were too embarrassed to slag him. Well Bill, this is a team with a bright future, right here in the present. And so it was the baby who was left in the basket outside the door of the convent became the best one of them all. The Cork manager, Peadar Healy, resigned immediately after the game. It seems to me you would want to be out of your mind to take over the managing of high-profile county team these days. Peadar wasn't paid a penny and he gave up two years of his life. The minute a manager takes on a job, the sacking talk starts. The dehumanising sheep-worriers on the web would knock Christ for taking too long to die on the cross. You can go now Peadar with your head held high. The seed has been planted. Mayo crossed several rivers and took over the Mackey Stand. Their desire for Sam is unrequited but their love of team is unconditional. The ratio of women to men was close on fifty-fifty. I have never seen so many women come out to support a team anywhere, ever. 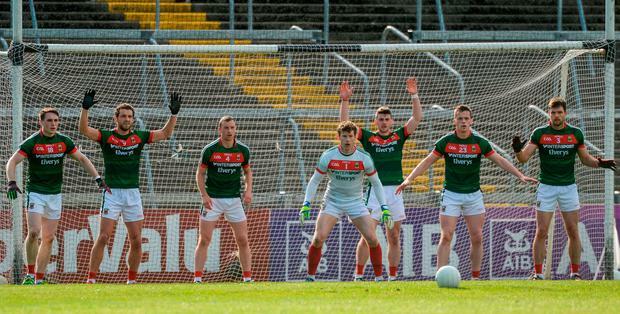 This Mayo team haven't won an All-Ireland, and I would say, so what? Mayo have given so much glory to those loyal fans, so many memories and so many big days out. There's succour too for all those who suffered from seemingly endless setbacks. Never giving up reaches out beyond sport. There were so many 'stand up and be counted' performances. The two O'Connors kicked points all evening long. Aidan O'Shea was selfless. For a while this year he had the bashful look of a man who was afraid to look in the mirror for fear of being branded as vain. Aidan hit hard, covered ground and won the 30-70s, but it was his skill and decision-making that set him apart. He has to be in the mix for Footballer of the Year. Andy Moran could turn the QE2 in a wash-hand basin. His kicking was of the highest quality. And his lay-offs were quicker than a bomb disposal expert. David Clarke made the save of the year, and it's only mid-July. Cork sent in a high ball and one of the forwards got a touch. Clarke did an instinctive Fosbury flop from a standing start while at the same time finger tipping the ball over the bar. Who said men can't multi-task? His miracle save was the loaves and fishes in reverse. The ball went over for a point and so it was the goalie turned three into one. Cork fecked about for a while with the blight of lateral passing, but this game is alien to a county who thrive on having a cut. Cork and safety-first are a terrible fit. The ball was moved out of defence as if they were following a hearse going up a hill. Mayo's tackling was relentless. It was at full tilt every time and they won scoring turnovers. Then the Rebels cut loose when all seemed lost. The big change was when Ruairi Deane came on. One of his solos was side-saddle and at speed. His mix of power, turn-tabling and skill opened up Mayo. The Bantry man banished the Cork blues. Inspired by young Sean Powter, Cork ran at Mayo and scored two of the best goals you will ever see. Right at the end of normal time, Luke Connolly showed some nerve for a young lad when he kicked the equaliser after referee Ciaran Branagan brought the ball forward. Cork seemed to have the force with them. Mayo huddled and worried in little groups. An older Mayo lady, for whom every step up the stand was a Croagh Patrick on its own, seemed to be whispering Holy Marys to herself and Holy Mary. A youngster opposite us in green and red pursed his lips again and again, like a goldfish gasping for air in a bowl that hadn't been washed out for some time. His fears seemed well founded. Cork started the extra-time the better. Evergreen Nemo man Paul Kerrigan, who had an almighty game, kicked a point and soon enough Cork were two up. In a game where there many turning points, the one that mattered most was when Keith Higgins soloed up the field with a dash undiminished by the ravages of time, injury and mileage. Mayo kicked on and after many twists, several turns, and a good few by-passes, they just about deserved the win. Mayo can't complain about the ref this time. Cork came out on the wrong end of a few close calls. But the premature end, by 23 seconds, was a fair decision. Three minutes was far too long for extra-time, on top of extra-time. And anyway, Mayo had the ball. Referee Branagan isn't easily fooled by diving forwards. The flow of the game was a testimony to his skill. He is a ref on the rise. This was an evening to remember. There were errors and some poor play but Cork and Mayo gave us a game worthy of an All-Ireland final. Their story is for the retelling time and again, when games of yore, are recalled by football firesides, and small children's bedsides.